NapUp put together a team of top designers, orthopedists, engineers and parents, and the NapUp head support was born – smart, sophisticated, yet simple to use. NapUp - the patent pending head support with its high tech approach in design, made of extremely high quality materials and complete compliance with international safety standards is truly in its own league. 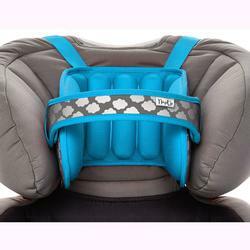 Children love using NapUp as it is cozy and comfortable. When the child is awake the forehead strap is positioned above the childs head without touching it. When the child falls asleep the forehead strap is lowered to the forehead leaving about 1-2 cm between the strap and the childs head. 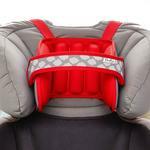 NapUp is not restrictive and allows for maximum movement, while keeping the childs head comfortably upright. NapUp is helpful for parents, as it frees them from having to worry about their sleeping childs head while they are driving and allows them to focus completely on the road, without distraction. NapUp is compliant with regulations and standards under CPC and the Consumer Product Safety Improvement Act (CPSIA). NapUp is made of advanced, non-sweat materials, OEKO-TEX Standard 100 and can be machine washed on cold in the delicate cycle. The product can be washed as is, without taking out any parts, as even the snaps on the product are rust-proof. Lay flat to dry (do not wring). Do not put NapUp in the dryer.